Combining its strengths — sophisticated haute horlogerie and high-tech sports watchmaking – Panerai now unveils the limited edition PAM 530 Luminor 1950 Rattrapante 8 Days Titanio. The split-seconds chronograph is built with a vertical clutch and two column wheels to operating two hands –superimposed and partially independent — to measure partial times or a second event simultaneously with the first event. To make it easier to read, the hand of the small minute counter moves in jumps instead of continuously. 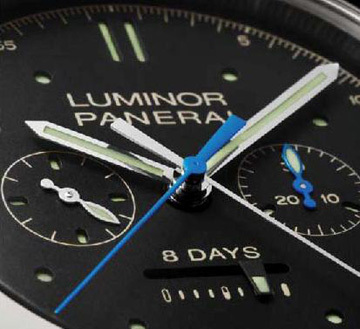 The dial features two superimposed disks with a layer of SuperLuminova between them for better underwater visibility – a hallmark of Panerai since the 1930s. The hand-wound P.2006 movement is built in the Officine Panerai Manufacture in Neuchatel according to the strictest standards of excellence. It offers eight days of power reserve made possible by a special patented system of three spring barrels. 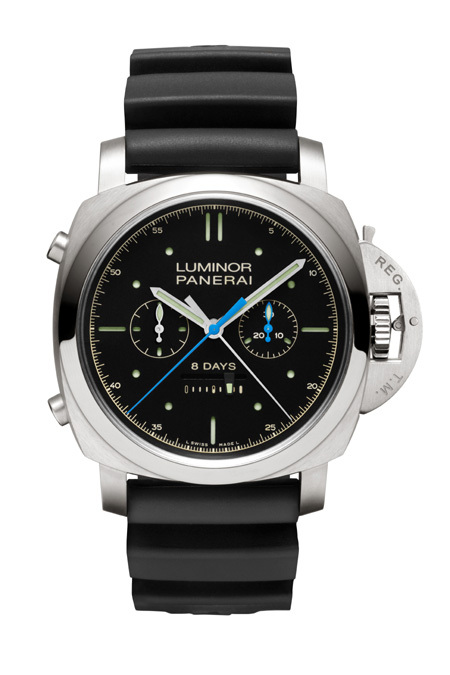 The indicator is linear and depicts the remaining power reserve above6:00. The rugged 47mm case is created of titanium and is fitted with Panerai’s lever device to hermetically seal the winding crown – ensuring 100 meter water resistance. The caseback is sapphire to allow viewing of the movement.